Have you noticed that your child no longer seems to be the playful and imaginative kid she once was? If so, it can sometimes be a little confusing, sad, and you may not know what to do about it. We tend to think of children as having a boundless imagination, without the possibility of ever becoming bored or disinterested. We’re pretty used to seeing children run in circles around the yard for hours on end (when they’re not messing around with electronics), seemingly content to pretty much do what seems like absolutely nothing. Sometimes we even envy children for their ability to turn everything into a game, or we envy the fact that children always seem to be able to transform the ordinary into the extraordinary. It’s pretty astounding to see children turn empty cardboard boxes into secret caves or watch them explore your garden as if it’s a jungle. So, when you notice that your child’s world has become a little bit smaller and her endless imagination seems to have hit a wall due to a state of indifference or malaise, it might leave you feeling a little bit perplexed or even a little depressed. And here, we’re not talking about preteens or teenagers. It’s to be expected that when children reach a certain age, that they’re not going to find absolutely everything in the world fascinating to the point where just a few knickknacks can serve as the building blocks to an entire universe. But when we’re talking about toddlers and your regular elementary school aged child, a diminished imagination or lack of desire to play can really be quite distressing and disconcerting. You may wonder if there’s something wrong you’re doing as a parent—if it’s your fault that your child seems to find little joy in playful activities. Maybe you’ve recently moved, or another sibling has been brought into the household, or you’ve recently gone through a painful divorce and you feel like major life choices you’ve made for your family have stifled your kid’s desire to play like she once did. It’s very common that when a kid appears to be depressed or disengaged that parents are going to blame themselves. While you should never blame yourself for your kid’s state of ennui or dwindling desire to play, there’s still something you can do to help your child spark her imagination and get her on the path to having fun again (and just keeping life fun and fresh overall). In general, simply buying stuff for your kid isn’t always the best way to cheer her up—at least not as some sort of long term fix. But, we are talking about play here, and the purpose of toys is to play with them. This doesn’t mean new toys every weekend, or such a wide array of different toys that you just assume at least one toy will stick at point and get your kid’s imagination going (often times, too many choices in any respect can lead to boredom). One thing you should keep in mind though, is that kids often like create little stories of their own using toys (this is especially true of action figures, but there’s always a good old-fashioned tea party with stuffed animals as well). If your kid is the slightest bit interested in playing with her new toys, she’s going to be forced to use her imagination. The process may take time, but by putting her in the position where certain toys inevitably lead to making up new and exciting stories, then your kid will definitely be on her way towards rekindling her imaginative spirit. This option might seem a bit odd, seeing as how watching a film isn’t really playing (you’re either sitting in a dark theatre or on the living room couch). But, it’s important to keep in mind that many films are meant to stimulate the imagination, and that this is especially true for films geared towards children. Yes, kids do have favorite movies that they love to watch over and over again (you might be a little tired yourself of being able to quote every single line from your kid’s favorite flick) but getting your kid to try something new is always a good thing. After all, monotony can lead to total boredom, and that’s what you’re trying to steer clear of in this case. You always have to remember that a kid using her imagination often means playing pretend. This isn’t true in every instance, but it’s usually the go-to form of play. As far as playing pretend goes, a lot of the time kids enjoy pretending to be whatever characters they see in a film. Whether it’s a Disney princess or prince, or a brave worldly explorer, or swashbuckling pirate—there’s no shortage of characters or types of characters for kids to pretend to be. Maybe you’re used to seeing your kid pretend to be a character from her favorite film and you’ve noticed that’s something she no longer enjoys doing. If you try watching a new film, she could very well be fascinated by the possibilities of stepping into a new, fictional skin. This one is fairly similar to watching new films. Not every kid is super excited about reading (hopefully she has some interest, and it really isn’t that hard to get your child into reading) but introducing your kid to new stories is definitely going to broaden your kid’s horizons and expose her to new worlds for exploration and new and imaginative ways to play pretend. And of course, reading is good for your kid (and you), so making the suggestion that you and your kid sit down and read together is never a bad idea. A kid’s enjoyment of a museum can sometimes be pretty hit or miss, and a lot of times museums are simply associated with learning (your kid isn’t always going to be excited if you say to her “let’s go learn”. You should be careful about this if you suggest to your child that the two of you read as well) but museums expose both adults and kids alike to new worlds, and that’s always good for stimulating the imagination of a child. There’s history museums, space and aviation museums, science museums, art museums (which typically have at least a few exhibits meant to appeal to children), toy museums—the list goes on. Again, when we think about playing pretend, museums can open up a whole new world for your kids to explore with their minds. For instance, seeing dinosaur bones might encourage your kid to play archeologist, a space museum could make your kid want to reach for the stars, or maybe your kid will enjoy pretending to exist in another time period. While your kid will definitely learn something at the museum, you don’t have to frame it the way for her at all (you probably shouldn’t even mention it). But learning new things is always guaranteed to open up new worlds (regardless of age), and if you’re trying to get your kid to regain her imagination, learning new things is one of the best approaches to take. You don’t always have the time to drop everything and go on an extended vacation, but if you can even afford to just take a quick day trip or weekend trip, that’s definitely something you should consider when you’re trying to spark your child’s imagination. After all, visiting new places is all about seeing the world from a different point of view, and sometimes a different point of view is all a kid needs to take her imagination to new heights. If it’s clear to you that your kid does seem bored, maybe she’s just bored of doing the same thing over and over. Just because your kid is bored, it doesn’t mean she’s miserable due to some major life change or event. Maybe you could try introducing your kid to a new sport (if it’s a recreational league of some sort, socializing with other kids is always a plus), try some arts and crafts (there’s tons of great arts and craft options, and let’s not forget that the arts and a strong imaginative sense go hand in hand), find some new board games, or maybe you and your kid can try and make up a game of your own. Maybe you’re the one who plays with your kid most of the time, or maybe you aren’t. If the latter is the case, then take things into your own hands and play with your child. You can’t just say to your kid “go out and play” and expect her to stay interested and engaged at every moment. Like anyone, our attitudes towards life are often determined by the people with whom we surround ourselves with. If you spend your time with people who stay positive, chances are you’ll stay positive yourself. The same goes for when you are constantly in the company of individuals with negative outlooks. When you think about people having an impact and influence on your outlook, you should keep that in mind for your kid as well. It’s sort of like making sure your kid doesn’t fall in with the wrong crowd. As far as staying playful is concerned, if you’re not playful yourself that might rub off on your kid. You can’t really expect your kid to have any interest in playing if you’re not willing to play with your child, and you should definitely remember that when your kid appears disinterested in general. And sometimes, a child’s sadness could very well come from a sense of loneliness. Isolation and lack of socialization isn’t good for anyone (especially during the developmental years in the life of a child), so simply doing fun things with your kid is a fantastic way to reinvigorate her spirits. Imagination is usually a result of inspiration (which is often sparked by others), so if your kid is in the doldrums, try and do your best to excite your kid simply by playing with her. Getting out there and meeting new people isn’t always an easy thing to do—it doesn’t matter how old you are. If you have a kid who is shy, that can make meeting other kids a little more difficult. You might want to try inviting your friends over who have kids of their own, which gives you the possibility to introduce your kid to a new playmate. Who knows? there’s always the chance that another kid’s imagination is absolutely out of this world, and if your child spends time with a new playmate, she might get some inspiration of her own. Your child and her playmate can feed of each other which can create mutual inspiration. So in this case, your kid can simultaneously learn about herself through others, expand her mind and learn how to properly socialize. This one is quite simple. You can’t stay locked inside the house at all times. It isn’t good for your kid, and it isn’t good for you either. Even if you live in an extravagant mansion, there’s only so much space to explore inside a home. Exploration will always open up the imagination, and you don’t have to sail the seas to do some exploring. You can try going on a hike, spend some time at the park, or you might want to consider just taking regular walks around the neighborhood. You’ve got to get your kid moving, and you can’t do that if you spend all your time indoors. 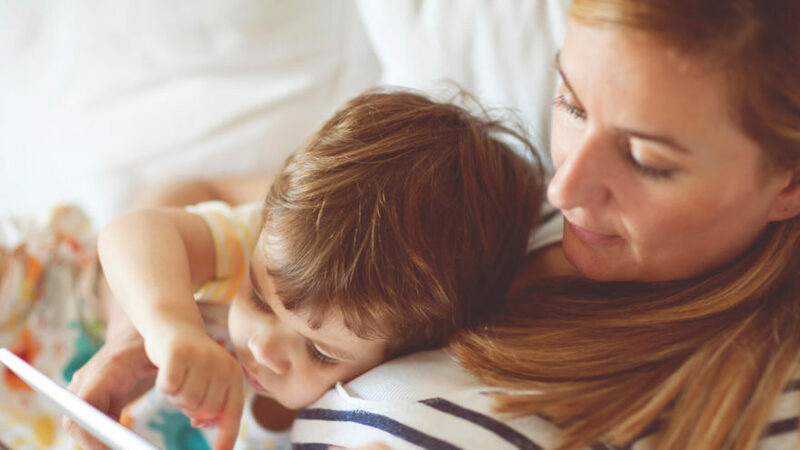 Video games and smartphones and tablets aren’t the worst options when your child is looking for something to play with, but constant time in front of the screen can definitely lead to boredom. Kids often play the same games over and over again, and screen time doesn’t really get your child moving or get her out and about. In order to be playful and imaginative, your kid is going to have to actually be in touch with her environment, and sometimes the environment of the screen is a pretty small one. Your kid is going to need to experience the world around her if you actually want her to use her imagination. That may seem kind of strange seeing as you can’t seem to walk more than a few feet (sometimes just a mere number of inches) without encountering a screen or an electronic device, but the chances are that your backyard isn’t just a pile of televisions and smartphones. Just because we live in a world in which were constantly surrounded by electronic devices, it doesn’t mean that we have to use them all the time. That can sometimes be hard to remember (the constant exposure to electronics is actually a relatively new thing), but it’s ok to just hang out with your kid outside without constantly being absorbed in the screen. Really, if you notice that your kid’s imaginative and playful spirit has gone by the wayside, all you have to do is just try new things and do your best to keep you and your kid’s life exciting. Remember, excitement isn’t just rollercoasters and bungee jumping. Sometimes excitement just means doing something new and fresh. We’re talking imagination here, and if you don’t broaden your kid’s horizons and open her up to new worlds, her imaginative character will almost inevitably become stultified. You have to introduce new things to your kid. Sometimes it’s as simple as a new toy, sometimes it’s a new playmate, and sometimes it’s a new place. Whatever approach you decide to take, just remember that if you make sure your kid has new experiences, that her imagination is bound to keep growing.